The Champagne invitation suite sets the tone for a swanky soirée with guests sipping from towers of bubbly and dancing on tables. Rendered here in sparkling shades of rose gold, champagne and vintage gold, this suite features a combination of foil embossing with matte metallic gold foil on ultra-thick, grey cotton cardstock and flat printed accompaniments, including a Weekend Details Insert, RSVP Card, Reply Envelope, Inner/Outer Envelopes and wrap-around gold leaf Address Label all in the event's extended palette of blush, taupe and textured cream. 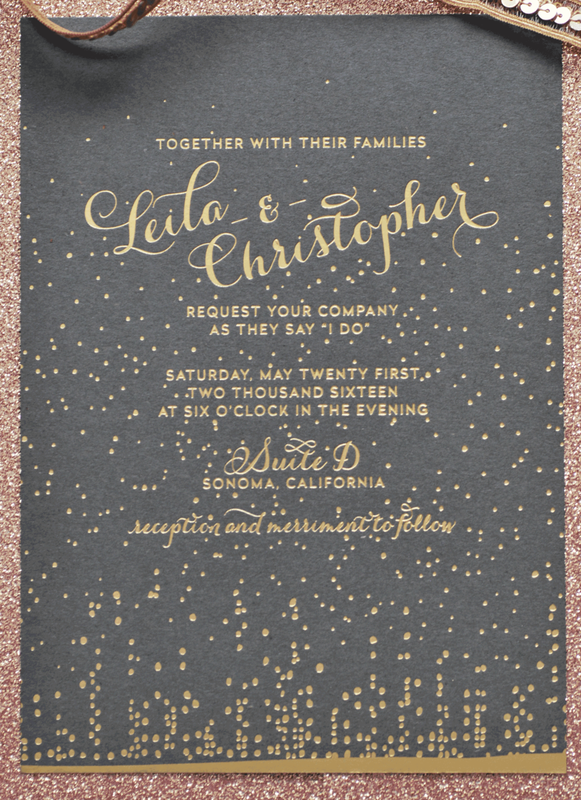 The couple's Save The Date introduced their sparkling wine monogram and a hand-drawn Custom Map of Sonoma, where they ultimately tied the knot. Day Of Materials included Guest Hotel Welcome Letters, a poster-sized Seating Chart, Table Number Signs, Personalized Dinner Menus, Drink Menus, Mini Hashtag Notes and Dessert Signage. Cheers!